"CLICK HERE FOR LARGE TRIPLE EXPOSURE OF THE ORIGINAL ARTIFACT"
This is one of the most skillfully made percussion flaked artifacts I have ever handled. The craftsman who made it five or six hundred years ago had reached a flintknapping skill level that would suggest that this person probably did this as a daily job or vocation. This extraordinary biface was found by Mr. Roland Kamer of Sweetwater, Texas while hunting rattlesnakes for the 1986 Sweetwater Rattlesnake Roundup. He found it on the surface of the ground in a gully. Other bifaces similar to this one have been found in this general area of the Southern Plains, although most are broken. It's believed that this biface could be related to the Caddoan Culture and Harahey Knives. If so, it could date to somewhere around A.D. 1300 to A.D. 1500. Newly made Harahey knives have the same ovoid bipointed shape as this examples does. By this definition the Sweetwater Biface was made to be used as a knife for butchering game. It would have been reduced in size by resharpening as it became dull or damaged from use. The control of the master craftsman who made this biface is amazing. 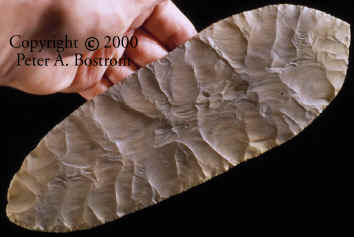 Modern flintknappers have made bifaces this thin but not nearly so wide. The wider the biface is the harder it is to strike off large thinning flakes across the midline to thin it down. The Sweetwater Biface measures 9 7/16 inches long, 3 3/8 inches wide and 3/16 of an inch thick. Thickness ranges down to 1/16 inch near the edge and 5/32 inch in the center. Most of the large percussion thinning flake scars extend 1 3/4 to 2 3/16 inches long. This artifact is so exceptionally well made that it is possible it may have been intended for ceremonial use such as being placed with a burial as grave offerings. Unbroken and unresharpened bifaces of this type are very rare so few have survived for comparison studies. The Sweetwater Biface is a lucky find that survives as a tribute to the master craftsman who made it so long ago.